This property is really nice and clean with a beautiful view . Perfect for families and/or group of friends. 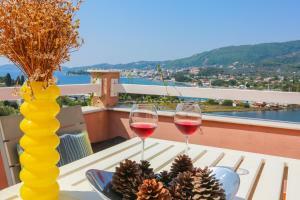 We enjoyed our time in Skiathos and this apartment. If you are staying for a whole week, definitely rent a car or get a good number for taxis. Enjoy your time there! Wonderful villa, comfortable rooms, A/C, lots of space and personal swimming pool! Very very nice appartment, wonderfull view, confortable and full equiped, everything that you need is present. The last but not the least, Thanasis was a formidable host. Very friendly, he shared with us a lot of tips, he booked for us a scooter which was brought to the appartment (very usefull). The owner's restaurant (Ergon) served us a good food. A very good option if you want to eat in the Skiathos city. The view! We loved it. Also Thanasis ( the host ) was very helpful explaining all the island's attractions and what would be the best beaches and restaurants. The appartement was fully equipped with everything and you have the feeling that you live in your own home. Moreover it was very clean with an astonishing view and an amazing bedroom. Perfect accommodation. A real home from home in a lovely location. Fifteen minute walk into town. The owner's dog is lovely. Definitely recommend these apartments. Nice host, amazing view and interior, everything you need for long stay (including laundry machine!). A vehicle is necessary fast to reach the city (1,8km) and the beautiful koukounaries beach (14km). The apartment is really nice, very clean and comfortably furnished. 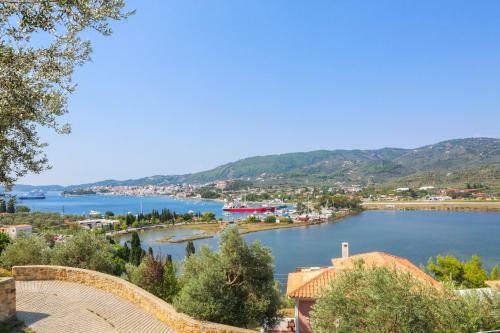 The view over the island and especially Skiathos City is stunning. The chambermaind comes around to clean the apartment every day. If you need help the owner is very helpful and considerate. The fact that the apartment is located not far away from the airport is no problem because there are only an few flights a day and at night the airport is not in use. location, views, owners willing to go that bit further to please, very clean and well equipped for self catering cleaned bins every day .VERY WELL DONE ! Lock in a great price for Saint George Villas & Apartments – rated 9.2 by recent guests! One of our best sellers in Skiathos! 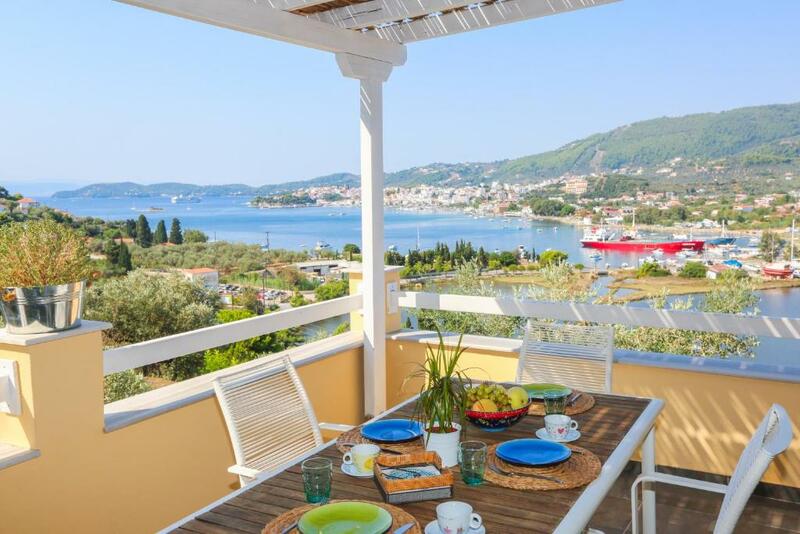 Located in Skiathos Town, Saint George Villas & Apartments offer self-catering accommodations with free WiFi access and views over the Aegean Sea, the lake, the mountain and the town. The nearest beach is 1.2 mi away. Opening to a furnished balcony and terrace, all air-conditioned apartments of Saint George feature 1 or 2 separate bedrooms. 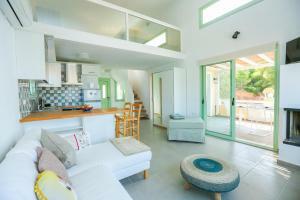 Each consists of a living room with flat-screen, cable TV and a kitchen with dining area and oven with hobs. A hairdryer and free toiletries are included. Skiathos Castle is 0.6 mi away and Papadiamantis House is 0.7 mi away. A supermarket for the general supplies can be found 0.9 mi away. The island’s port is at a distance of 0.9 mi and Skiathos Airport is 0.6 mi away, while free airport shuttle is provided. When would you like to stay at Saint George Villas & Apartments? Opening to a furnished balcony and terrace with views over the Aegean Sea, the lake, the mountain and Skiathos Town, this air-conditioned apartment has a separate bedroom. 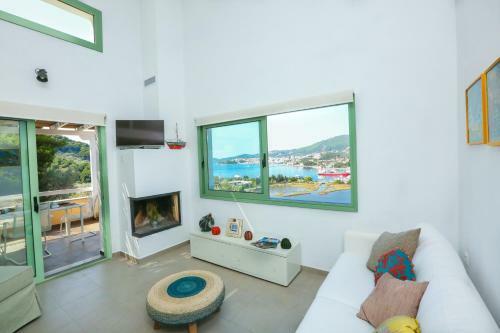 It consists of a living room with flat-screen, cable TV and a kitchen with dining area and oven with hobs. A hairdryer and free toiletries are included. Free WiFi is provided. Opening to a furnished balcony and terrace with views over the Aegean Sea, the lake, the mountain and Skiathos Town, this air-conditioned apartment has 2 separate bedrooms. 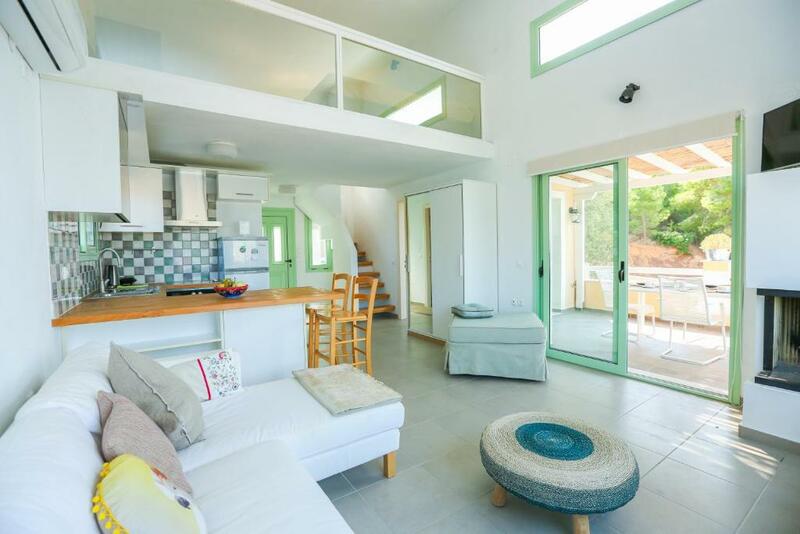 It consists of a living room with flat-screen, cable TV and a kitchen with dining area and oven with hobs. A hairdryer and free toiletries are included. Free WiFi is provided. This villa has a cable TV, dining area and toaster. This apartment features a private entrance, tile/marble floor and balcony. 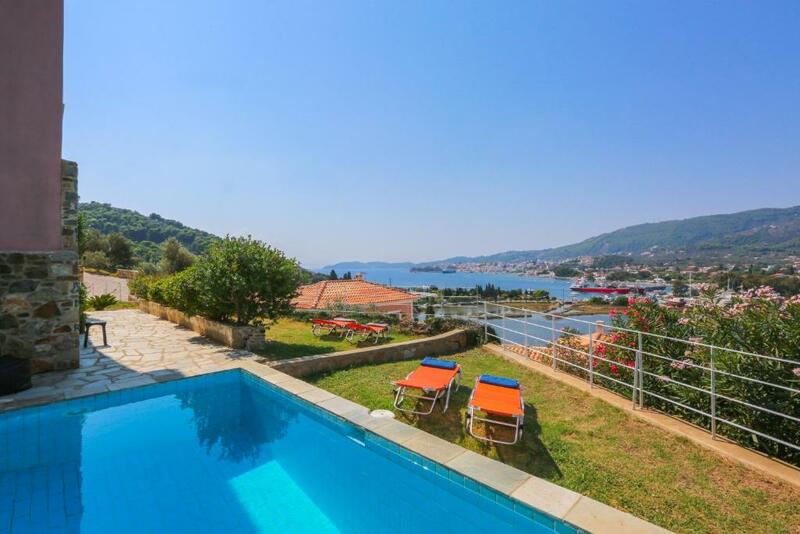 Saint George Villas and Apartments in Skiathos is a fantastic complex of four newly-constructed houses, situated in a quiet location just outside Skiathos Town. These four buildings have been built on different hillside levels, granting privacy one from the other. 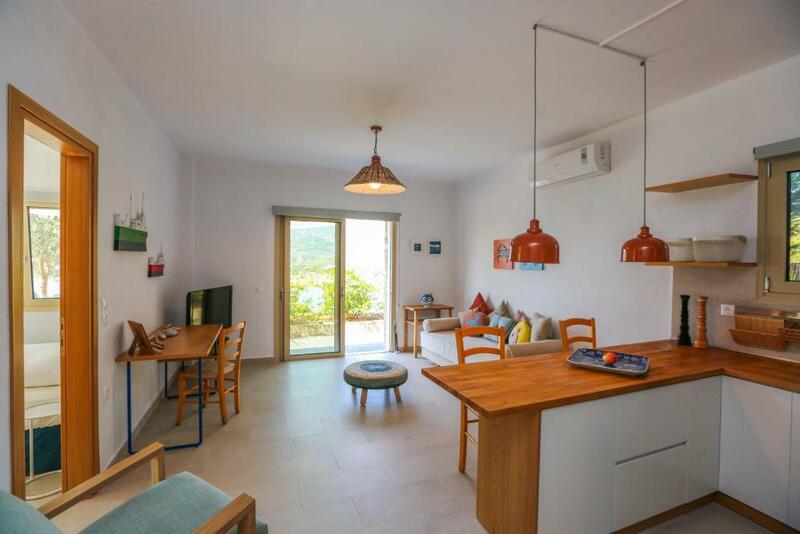 Our high-quality villas and apartments offer self-catering holiday accommodation, privacy, all the amenities you can have in a hotel, home comforts and personalized hospitality. 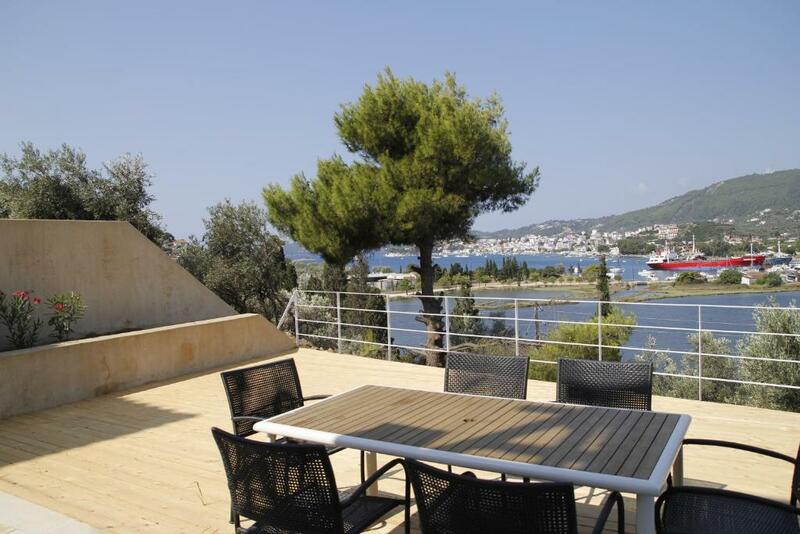 Their location offers solitude plus a fantastic view to the Aegean sea and Skiathos Town. In fact, our villas are found in front of the lake of Saint George, surrounded by pine and olive trees. Skiathos Town is only 1,8 kilometers away while the nearest beach is Xanemo (2 kilometers away). Our Skiathos apartments for rent are a cost effective option for families with children, friends or romantic getaways for couples. House Rules Saint George Villas & Apartments takes special requests – add in the next step! Saint George Villas &amp; Apartments accepts these cards and reserves the right to temporarily hold an amount prior to arrival. Saint George Villas & Apartments accepts these cards and reserves the right to temporarily hold an amount prior to arrival. Please inform Saint George Villas & Apartments of your expected arrival time in advance. You can use the Special Requests box when booking, or contact the property directly using the contact details in your confirmation. The way up to the villa was extremely steep. Beds need to be more comfortable for the price and needs to be cleaned more often. The lighting in the kitchen box over sink is non-sufficient. Drunken loud young people in other apartments till early hours of morning, had to keep windows/doors closed at night. Unsafe steep stairs to mezzanine, needs a hand stair rail, useful to point out how steep drive way is unsuitable for unfit people to walk up ,needs lighting on drive as dark at night ,rough concrete and could trip/fall (we were a group of 4 aged between 27-60 and wanted to walk as much as possible, so on average did the trip up/down the drive 4 times a day/night during our 10 day stay. We took taxi back from town when carrying heavy shopping three times).P.S observed quad bike roll back into wall, after being parked up for a while?,after that they put chocks under back wheels. Everything, from the pick up at the airport to the cleanliness of the apartment to the position and to the transfer back to the airport. The host Nicos and his manager Demetrius were on hand at a moments notice to answer any questions. The only slight downside was the gradient of the drive to get to the parking space and the apartment. Otherwise fantastic. Wasps......just that time of year. This was an island wide issue. The very steep walk up to the apartments (the last 100 metres). The maisonette was one of the best properties we have stayed in. Clean, modern and bright with great views. The hosts Nikos and Dimitris were very helpful. We were met at the airport and transferred to the port when we left. Thanks. A lovely apartment, everything we needed- very effective A/C and Wi-Fi. Beautifully decorated and friendly, helpful host. We had no car so a 20" walk to the town- easy enough.